Texting and driving has become commonplace among teenagers after more than half of high school seniors admitted to sending messages behind the wheel. A national survey, carried out anonymously, found that 58 per cent of seniors said they had texted or emailed while driving in the month of May 2012. Some 43 per cent of high school juniors in the U.S. also acknowledged that they had the dangerous habit, according to the study by the Centers for Disease Control and Prevention today. CarInsurance.org prepared the following texting and driving stastics, and the numbers are just appalling. COMMENTARY: Texting while driving is a serious crime. How serious, you ask? Aaron Deveau, an 18-year old teen, was convicted of motor vehicle homicide by texting – the first driver in Massachusetts to face such charges, the Boston Globe reported. Prosecutors said Deveau, who pleaded not guilty, was texting on Feb. 20, 2011, when his vehicle swerved across the center line of a Haverhill, Mass., street and crashed head on into Daniel Bowley’s truck, killing the 55-year-old New Hampshire father of three. On June 6, 2012, Deveau was sentenced to a year in prison and loss of his license for 15 years for causing a fatal crash by texting while driving. This is the kid being carted off to prison. Bowley’s sister, Donna Burleigh, said her brother suffered severe head trauma and lingered in a Boston hospital for 18 days before dying. Before imposing the maximum sentence on Deveau, District Court Judge Stephen Abany said he was sending a message of deterrence to Massachusetts drivers. Abany said, according to the Globe report. Healthcare spending in 2009 grew four percent, the smallest rise in half a century according to a new CMS report on national health spending released Wednesday. The relatively small increase was due to a mix of the recession and high unemployment, which dried up outlays for most medical goods and services, because people were less willing to whip out their wallets and indulge in out-of-pocket purchases. Even so, healthcare spending as a share of gross domestic product continued to rise. The $2.5 trillion spent on healthcare represented a whopping 18 percent in 2009, up one percentage point from 2008. This can be explained, at least in part, by a smaller overall spending base due to the shrinking economy coupled with Medicaid spending. The latter grew 9 percent last year (compared with a 5 percent increase in 2008) as more people became eligible for and enrolled in Medicaid. The recession did slow spending on private health insurance, which grew by just 1 percent in 2009, compared with 4 percent in 2008, due to a drop in enrollment. Spending for home health care services provided by freestanding facilities grew 10 percent, to $68.3 billion, following growth of 8 percent in 2008. Retail prescription drug spending grew 5.3 percent in 2009 to $250 billion, after 3 percent growth in 2008.
pared with 5 percent growth in 2008. Physician and clinical services spending rose 4 percent in 2009 to $506 billion, a deceleration from 5 percent growth in 2008. Health insurance company CEO's are compensated as they should be. After all, America has the greatest health care system in the world. The 2009 compensation packages of the CEOs of the seven largest health insurance companies only one CEO who earned less than $6.5 milliion--HealthNet's Jay Gellert. The health insurance industry is among one of the most heavily scrutinized--by the press and federal regulators. Most recently, WellPoint and CEO Angela Braly have faced intense criticism for their unusually high rate hikes and a rescission scandal involving breast cancer patients. Braly's generous 2009 compensation package has roused even more ire from critics. Still, her salary pales in comparison with two of her well-placed colleagues--Ron Williams and Allen Wise. In March 2009, at the height of Barack Obama's fight for health reform , comedian Will Ferrell and other celebrities banned together to produce this skit that pokes fun at and defends the insurance companies and high salaries of their CEOs, all in good humor, of course. Health insurance costs for hundreds of thousands of individual policy holders with Blue Shield of California could go up as much 59 percent this year, according to the Los Angeles Times. The California health insurer has announced it is seeking to raise rates an average of 30% to 35% for 193,000 policy holders due to rising health care costs, the fact that healthier people are dropping coverage during a bad economy, and other factors. Roughly one in four of Blue Shield of California customers are expected to see increases of more than 50% over five months. Most of those who hold individual policies are self-employed, aren't covered by their employer or have been laid off. "Rates are going to continue to rise unless the cost of medical care is brought under control," Blue Shield spokesman Tom Epstein told the LA Times. 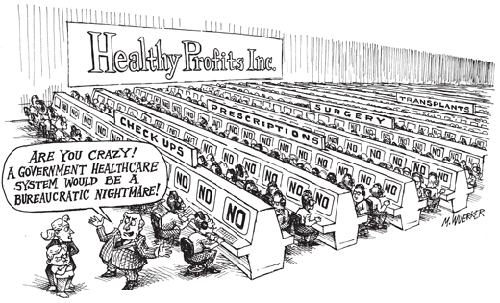 "We need to reduce what we pay to hospitals, medical groups and pharmaceutical companies." "The rate increases reported today cover a period of more than one year and have almost nothing to do with the federal health reform law," Blue Shield of California said in a statement. "These rates reflect trends that were building long before health reform." Despite the rate hikes, Blue Shield of California said it expects to lose tens of millions of dollars on its individual health care business in 2010 and 2011. Last year Anthem Blue Cross proposed a 39 percent increase for its nearly 800,000 customers, but a public outcry forced the insurance company to settle for a maximum hike of 20 percent. Anthem Blue Cross announced Wednesday that it expected to raise rates again an average of 9.8% for individual policy holders. Health insurance premium hikes greater than 10 percent would be reviewed by state or federal regulators under new rules proposed by the United States Department of Health and Human Services in December of 2010. I suppose I could go on and on, but some of you will just label as a whinner or accuse me of spreading liberal propaganda, but the facts speak for themselves. 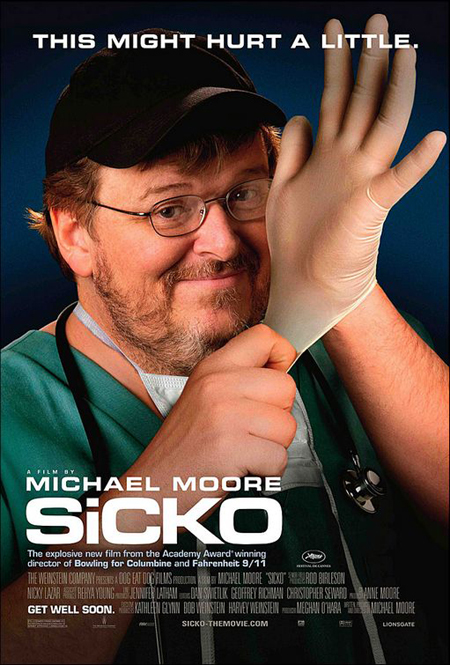 To demonstrate that I am a nice guy at heart, here's a free movie ticket for SICKO by Michael Moore. The truth always hurts. To your good health. Now bend over.